Fed Square is home to major cultural attractions, world-class events, tourism experiences and an exceptional array of venues. Federation Square is incredibly hard to imagine Melbourne without and has recently been named the 6th Best Public Square in the World. 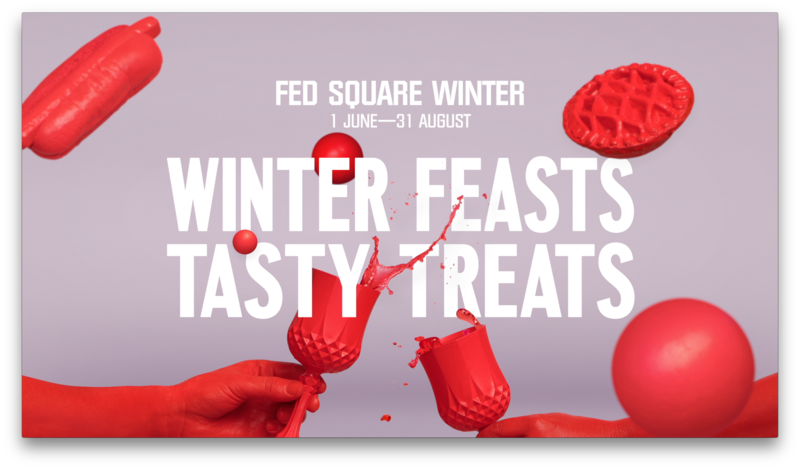 Fed squares marketing director wanted to bring their most recent 2017 winter campaign designs to life and after collaborating with one of Melbourne’s most renowned design agencies, they wanted to take it further. “The designs looked great, but we wanted to make them move, it has so much potential to be an animation installment that we can play on our big screens and social media”. We were excited to be collaborating with a design agency who provided the final artwork. It turns out we had a lot in common. It’s like we spoke the same language as we both come from similar creative fields. We proceeded to animate one of the themes, making the elements move in interesting ways to engage viewers. We also considered the deliverables and optimised the animation in a way that it could also work on social media. Using big bold texts, vibrant contrasting colours and framing it to work on both widescreen and square aspect ratios were all considered when working in this animation. Once that was signed off, we went full throttle and created the rest of the animated content, one version suitable for their big screens and another re-edited for social media. It was a big hit! In a nutshell, our animations were nothing short of complimentary to the designs and concepts of the clients. As usual, our team had a great time working on this piece and would welcome the opportunity to collaborate again, we always welcome fresh ideas and a chance to explore new ideas.